Furthermore, all attempts to persuade the Thai Government to issue an Op Crown medal ultimately collapsed, even with the support of the DA British Embassy, Bangkok, the Thai DA in the Royal Thai Embassy, London and the AD Foreign Liaison Division, in the Thai Directorate of Joint Intelligence. As a consequence of the above, it was proposed that we investigate the cost of having our own commemorative medal produced with the casting and tooling costs being paid by OCA and full members paying individually for the medals they require, at cost price plus P&P. 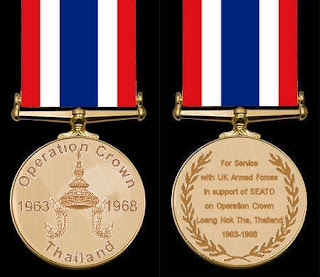 Non-members would be able to purchase medals from OCA at a small additional cost so the Association could recover part of its casting and tooling costs. Commemorative Medal with Ribbon on bar, ready to wear & in presentation box. £43.80 incl VAT. This is the maximum price dependant on the production run. To be paid by individuals but price could be as low as £34.80 if production run is 100 or more. Engraving with No. Rank & Name at date of service during 1963-68 £15.00 incl VAT. To be paid for individually. individual cost of £17.58 incl VAT, again subject to production run required. Before the Association progresses the matter and arranges production, persons are requested to let us know of their requirements asap, in simple terms such as 1 x Full Size Medal with or without engraving and/or 1 Miniature Medal. We will then place a firm order once we have some idea of the quantity required. Whilst delivery time is forecast to be 6 weeks, individual costs will be requested in advance to avoid any financial risk being taken by the Association. The design of the medal will be on the lines of that attached to this proposal. Both the UK MoD and the Thai Govt have been approached about the design and there have been no objections.